These amateur facilities were constructed for the amusement of a retired nuclear physicist and produce observations of interest to students, neighbors, friends, and himself. The author can be contacted alucas0217@aol.com. A small consulting company dealing with laboratory measurements of radioactivity in soil, water and air along with the remediation of contaminated nuclear environs. A recent project has involved the conversion of one of the 14-Telescopes to F:2. Here's a quick report on the project. Some comments and pictures of the 2017 Solar Eclipse and January 2019 Lunar Eclipse. Take a peek inside the facilities that make up the Bluebird Observatory complex. Occultations of stars by the edge of the moon can provide information about the profile of the moon. 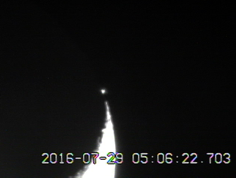 Take a look at images collected by the Oklahoma State University group during the July 29, 2016 grazing of the moon by the bright star Aldeberan. 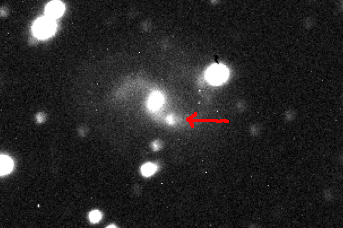 A supernova from August 2013 that hid in the Deep Sky observations unnoticed until now! Recent nearby supernova observed in M82. Inspired by the Hubble Deep Field images and increased tracking stability and adaptive optics capabilities at Bluebird Observatories, the images in the Deep Sky folder represent the stacking of long exposures of relatively "bare" chunks of sky. 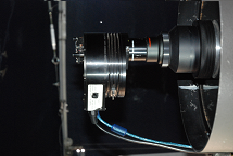 Isolux images are used to analyze features of the various galaxies analyzed. A library of Messier objects is being developed for use in planning measurements in and about these objects. The images were obtained by a standardized methodology so as to permit choosing the optics and analytical methods for further studies in and about these objects. Miscellaneous color photos of galaxies and nebulae taken at Bluebird Observatories. The wanderers of the solar system provide a number of photographic opportunities. As well, occultations of various small magnitude stars by pluto may provide some insights into the existence of debris in orbit around pluto. Continuing the study of the minor planets, this report (pdf) (doc) discusses the tracking of Eris. The hope is that, if a potential occulations exists, the data precision will be sufficient to make the prediction real. Notes on the picture to the left. Due to their size, asteroids are typically difficult to observe directly, but they are capable of reducing or eliminating the light from a star if they pass directly in front of them, creating an occultation. IOTA, the International Occultation and Timing Association, is an organization of amateur and professional astronomers who use occultations between two objects to do such things as refine calculations of asteroid orbits. Large balls of ice orbiting the sun in highly eccentric orbits, comets can be a lot of fun to photograph. Here are a couple of examples.